Geeksnerds JFS partition recovery software recovers lost and corrupted partitions and files from JFS file system created by using linux operating systems. Our JFS partition recovery software is a user friendly recovery tool with powerful recovery algorithms and follows a systematic process to recover corrupted partition. It also performs raw file recovery process on partition and even on drive. Step 1: If you have lost Linux partition then you can recover it by using Find Partitions option after selecting 'Find Partition' option from the toolbar or 'Scan Partition' option from the context menu. If you want to do a new scan then select the first option that is 'Go for New Partition scan wizard' and then select the 'Next' button to proceed. 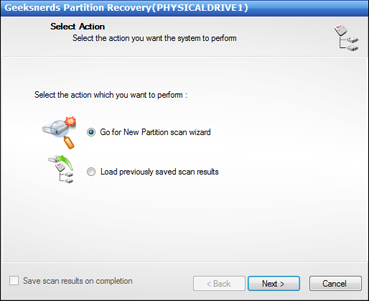 Step 2: Geeksnerds JFS Recovery software will show a dialog of settings for partition scan. 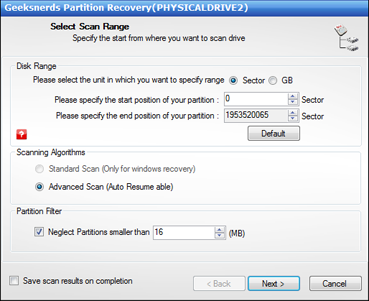 You have the option to select the 'Disk Range' of drive for starting and ending of the partition scan. You can also select range in Giga Byte by selecting the GB button. You can also set default range by selecting default button. After selecting disk range, you can also select the scan type, there are two types of scan, i.e. 'Standard Scan' and 'Advanced Scan'. Detail Scan will scan drive in depth and will take several minutes depending on the drive size. 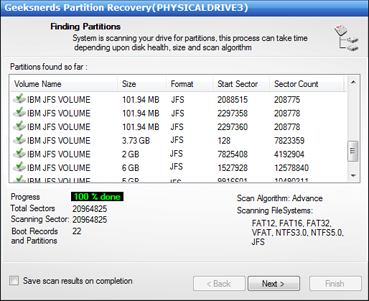 In Advanced Scan, the JFS recovery software will scan through all the drive sectors and scan for any lost partitions. You can also specify size of the partition from the 'Partition Filter' option, so that it will neglect partitions which are smaller in size then the size specified. Select the Next button to proceed further. 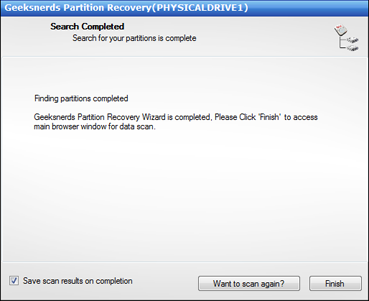 Step 3: Geeksnerds JFS recovery software scanning lost partitions from the selected drive. 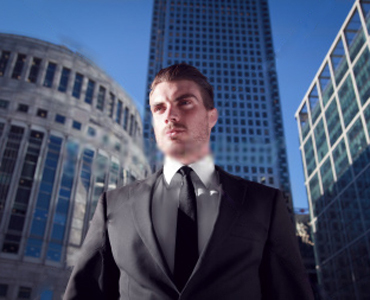 Step 4: If you want to scan again the selected drive, then select the 'Want to scan again?' button, otherwise select the 'Finish' button to complete the scanning process.